How much can be made dutching? Dutching is another great way to make money from matched betting and it does not rely on free bets to make money which is also great if you have a gubbed account. Dutching involves placing back bets at different bookmakers to cover all outcomes to make a guaranteed profit. It is similar to arbitrage apart from there are no lay bets involved as you are backing at the bookies. 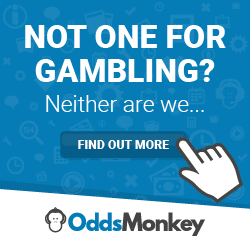 Oddsmonkey have made dutching even easier by creating their own matched betting software for this called the Dutch matcher. The Dutch matcher works in a similar way to the other pieces of matched betting software Oddsmonkey has created in that it ranks the matches in order of the most profit you can extract as soon as you click the refresh button. The matches that usually appear are football games and tennis matches. I think it is best to use the Dutch matcher for tennis games as there are only two different outcomes whereas in football there are three. When dutching on football, you have to login to three different bookmakers and then deposit the specific amounts into each bookie which can seem like a lifetime in this game. What could happen is you could place two of the bets with two different bookies and then the final bookie has changed their odds; if this happens it could put you at a loss. In tennis, you can place the bets very quickly so there is less time for the odds to suddenly change. I have made money on tennis dutching on many occasions thanks to the Dutch matcher. The filter button on the matched betting software enables you filter the sports you wish to dutch on, the bookmakers you wish to bet with, the type of betting market you want to bet on and you can select the minimum and maximum betting odds as well as the timeline all to make your dutching experience much more convenient. In my own dutching experience, I have not seen many ratings above 110.00 meaning no more than 10% of the total staked. I have done several tennis dutches where the ratings were 5-6%, so I made £6 for every £100 I staked which is pretty good. Again the margins are similar to arbitrage betting but you are less likely to be flagged up from dutching unless you are placing abnormally large stakes of several thousand pounds. If you place 10 dutching bets a month of 6% to £1000 stakes, you can expect to make £600.00 so the potential is pretty good. One thing to be mindful of when dutching is the staking you decide to do as it is very rare to do dutching in whole number stakes. This is how dutching differs from arbitrage. When you place an arbitrage bet, you can stake whole amounts at the bookmaker and then place a lay stake in decimal numbers on the betting exchange. In dutching, the calculator rounds up to the nearest decimal place which will flag up at the bookmakers. The bookies many wonder why you are depositing £381.74 and then betting that specific amount with them. Most mug punters would always bet in whole numbers and that is why it would flag up. Thankfully the Dutch matcher has its own built-in calculator to help you round to the nearest whole number. In the top right of the calculator, you can see the “enable stake rounding” button. It is best to click this button every time you place a dutching bet to avoid betting in decimal numbers. Where possible, it would be better to bet to the nearest £5 or £10 to avoid arousing suspicion at the bookmakers. When doing this, you won’t make the same amount exactly whatever the end result but you will still make a profit and you won’t get noticed by the bookies which is great! In the example above between Hertha Berlin and Ostersunds, you can see I tried to enter a total stake at the button of £1,000 but because I clicked the enable stake rounding button, it has rounded it to the stakes to the nearest whole number. So if Hertha berlin won I would make a £29.20 profit, if they drew it would be £29.50 profit and if Ostersunds won I would make a £30.21 profit. So no matter what happens, I would walk away with a profit! I will explain how the maths behind dutching works below so you know how you actually make money from dutching. If Hertha Berlin win the game, you will have £1025.20 (£466*2.20 = £1025.20) in your Unibet account. Then deduct your £996 total stake and you are left with £29.20 profit. If the game ends a draw, you will have £1025.50 (£293.00*3.50 = £1025.50) in your Sportingbet account. Then deduct your £996 total stake and you are left with £29.50 profit. If Ostersunds win the game, you will have £1026.21 (£237.00*4.33 = £1026.21) in your Skybet account. Then deduct your £996 total stake and you are left with £30.21 profit. If you do decide to do dutching on football, make sure you check the odds are correct at each bookie before placing your first bet to ensure you don’t end up making a loss. It would also then be good to have each page open on your web browser and then deposit the amounts into each bookie before placing the first bet then you avoid the risk of the odds changing half way through placing your bets. To make the most of dutching and make a few hundred pounds extra each month, it is best you use the Dutch matcher available at Oddsmonkey so that you are not endlessly searching for dutching matches on your own. Dutching is good because the profits are quick and easy just like in arbitrage except you are less likely to get your accounts flagged by the bookmakers. Any pitfalls to be aware of when dutching to avoid account grubbing. That’s the most important thing to do when dutching.